"Time’s up! Let’s shape the Market for Flexibility together!" Our project on Generalized Operational FLEXibility for Integrating Renewables in the Distribution Grid 'GOFLEX' is part of the European Commission's research and innovation framework programme 'Horizon 2020' and implemented by a consortium of 12 partners from the following European countries: Ireland, Slovenia, Denmark, Germany, Cyprus and Switzerland. In the call for competitive low-carbon energy (LCE) (H2020-LCE-2016-2017), GOFLEX addresses the topic "Demonstration of smart grid, storage and system integration technologies with increasing share of renewables: distribution system” (LCE-02-2016) within the "Horizon 2020 Work Programme "Secure, Clean and Efficient Energy”. 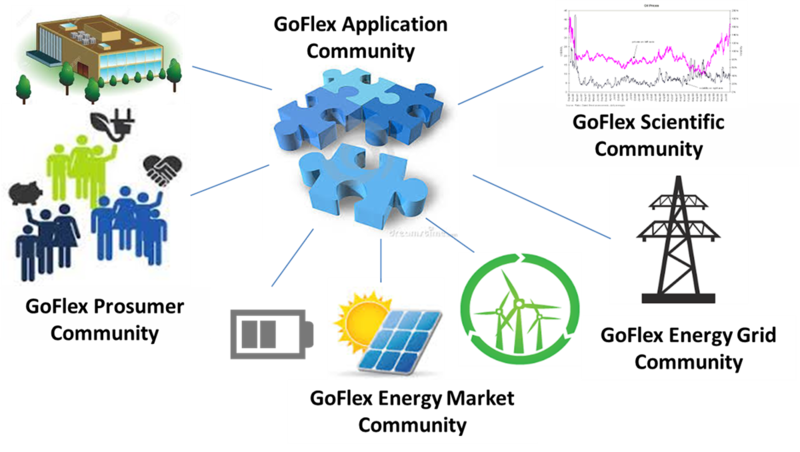 Therefore, the GOFLEX platform will provide features to manage and trade flexibility commercially with consumers, generators and prosumers. GOFLEX is tested at three European demonstration sites involving over 400 prosumers from industry, buildings and transport - in Cyprus, Germany and Switzerland. We aim at collaborating with all companies and projects who want to push the market for energy flexibility by exchanging experience and technology.